Are Pixie Bob Cats Your Kind of Breed? A breeder sent me information on Pixie Bob Cats, and I thought I'd share some of it with you. Pixie Bobs, from what I can gather, are definitely an interesting breed, and worth considering as a pet for some. The International Cat Association (TICA) describes the Pixiebob (all one word) as a "domestic cat with a visual similarity to the North American Bobcat..."
Most of the breeders I've seen refer to them as Pixie Bob Cats or Pixie-bobs. There are two main aspects to the appeal of these cats. First is their exotic appearance, resembling a wild cat. One of my favorite cat breeds, in terms of looks, is the Bengal. Like the Bengal cats, Pixie Bobs have a bit of a wild appearance. Although there is no genetic evidence of this, Pixie Bobs are said to be of probable bobcat heritage by some. They are bred to look like small bobcats. More on their origin is below. Some have lynx-tipped ears, giving them an even more wild look resembling the lynx. Some non-show quality Pixie Bob Cats have long tails. The standard in show quality, however, is a very short tail. Cats that are born without tails are also not show quality, and may resemble the tailless Manx cat. One thing to note is that these tailless Pixies may have trouble with incontinence, as do some of the Manx, so be aware of this when choosing your pet. Second, these cats are described as having dog-like personalities. Some hybrid cat breeds with wild origins may retain some undesirable wild traits. This is not so with Pixie Bobs, as they are very sweet domestic cats and make great pets. The myth of the bobcat gene in these cats makes for good breeding legend, though, and their wild look makes them a good alternative to hybrids. 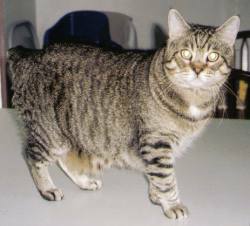 The Pixie Bob Cat breed was started by Carol Ann Brewer in 1985 when she got her first cat she called Keba. He was found traveling around with a dog in the foot hills of Mt. Baker. He was a big cat, weighing about 17 lbs., with a hock length tail that wagged like a dog. He also had a very different attitude! Keba became the sire of the breed's namesake, "Pixie". Maggie was the dam to Pixie, who looked very much like the coastal red bobcat. Both Keba and Maggie were very wild in both their looks and temperament. Pixie was the first cat in the breed to be recognized by TICA. Pixie Bobs are unusual in personality as cats go, and they are definitely not content to be lap cats. In Sandra's experience, they've been known to play in the water while you're taking a shower, and play fetch like a dog. Some even love riding in the car (without a carrier). Most cats hate car rides! They're very curious cats and like to inspect almost everything they encounter. Sandra says that sometimes that's a good thing, and sometimes that's a bad thing! You may be surprised to learn then, that Pixie Bob Cats tend to be very careful about your valuables. She's never had to put breakables such as nicknacks out of their reach. Around the family, Pixie Bob Cats are great with kids. They are very caring and careful, even when near a young baby. They also tend to get along well with other animals in the house. Typically, though, they adopt a take charge attitude over the other pets. Being more than just people oriented, "they seem to sense your moods and can be very loving when you're in a down mood," Sandra said. They love to jump, and when they do, they leap like a bobcat, jumping up high. They're also very smart, and will get the hang of opening cabinets and getting into places you wouldn't expect. They're very devoted to their human family, and enjoy spending time with people. They own you of course, you don't own them. I have found this to be the case with most cats. I've found many cats to have unique voices. When Pixie Bobs meow, it's not quite like your average house cat, being more of a howl. They also use a high chirping tone, depending upon their mood. Also, put away the tuna. Tuna meals are not for them, as it can make them very sick. This is something that Sandra learned first hand with her cats. As far as the feet and toes are concerned, Pixie Bob Cats can be "straight footed" or polydactyl (with seven toes maximum for show quality.) A straight footed cat has 4 or 5 toes in the front, and only 4 in the back. A polydactyl cat is said to be many-toed. This means it has more toes than "normal." So, front paws with more than 5 toes, and back feet with more than 4 toes are considered polydactyl. Polydactyl back feet are sometimes called "rabbit feet." There are two types of polydactyl front paws. The first looks as though the cat actually has thumbs, and is called just that, "thumbs." This is also called "mittens" since it gives the appearance that the cat is wearing mittens. The second type has extra toes, as all polydactyls do, but the toes do not stick out since they are pretty much even length. Cats who have this type of foot are said to have "patties." The short haired version of the Pixie Bob Cat is soft and wooly, with the belly hair being denser and longer than the rest of the coat. For the longer haired version, the coat is soft and lays a little closer to the body. In both short and long hair cats, the coat is weather resistant and separates easily. The ground color is intensified in hot weather, and cold weather will give a frosted appearance to the coat. Coat patterns for Pixie Bob Cats include small spots with or without rosettes, with the coat having a "ticked" pattern. Ticking refers to having several colors on each strand of fur. My oldest cat, Priscilla, is a tabby with lots of ticking. Who knows, maybe she as some Pixie Bob in her! Ticking tends to mute out the spots a bit, and also gives the cat a different appearance depending upon the light and the viewing angle. Random spotting is actually preferred in this breed, and for show cats, the belly must be spotted. As far as coat color goes, most Pixie Bobs are some variation on cream with either red or silver highlights. They may be marbled or spotted, tabby striped, or even a solid color. Some are red coated with red spots. These are beautiful cats. Some cats get very attached to one person, while Pixie Bobs tend to like anybody and everybody who comes along. If you're the jealous type, you might want to learn to let go! When properly socialized, your Pixie Bob will make the rounds, happily accepting affection from anyone who'll give it. Not too surprisingly, their personalities allow for leash training in most cases. If you'd like a smart, wild looking, social, and people oriented cat, then the unusual Pixie Bob Cat might just be for you. Remember though, that very smart cats with loving personalities often require a lot of attention. Choose your pets wisely! If you'd like more information on this breed or would like to adopt, contact Sandra Janoski at S_R_ISAIAH AT MSN.COM.